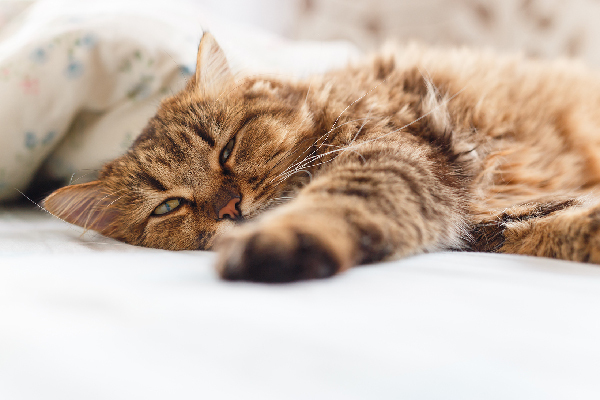 What causes stress in cats and what are the signs of stress in cats? Photography ©PhenomArtlover | iStock / Getty Images. Think vertically: Cats like to be able to relocate to a safe space if they feel threatened by a person or another animal. Cat trees are a great way to provide a safety zone. Gradually initiate change: Cats are creatures of habit, so abrupt changes — even small ones — can affect them in big ways. If you’re switching brands of food or litter, transition gradually by adding a little at a time to their existing brands until the switch is complete. Keep litter boxes clean: Kitties are fussy about their “bathrooms.” Scoop their boxes several times a day, and completely dump and add fresh litter once a week. Behind closed doors: If your cat is stressed by strangers inside the home, move her to a quiet space behind a closed door. 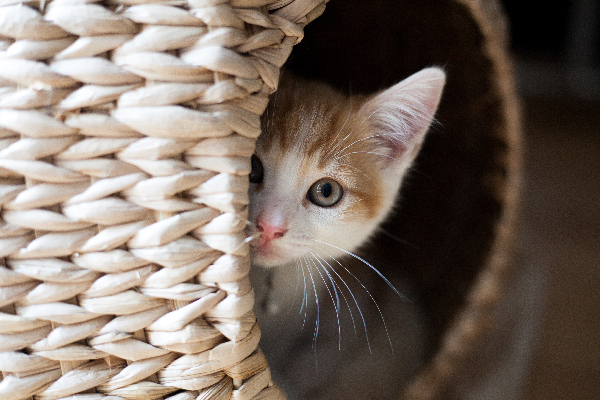 Keep noise to a minimum: Some cats are more sensitive to noise than others. 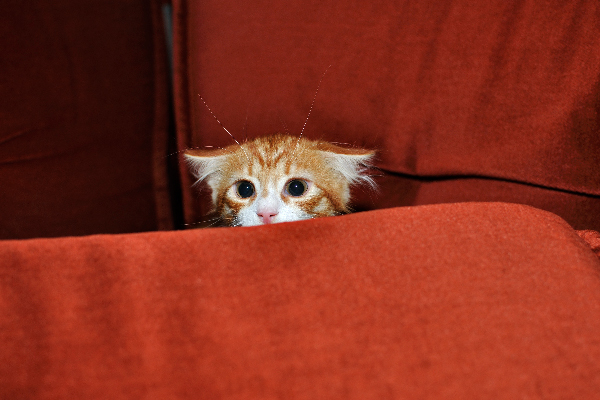 If yours is on the sensitive side, be mindful of how loudly you play your music, and place kitty in another room while vacuuming or using the blender or hairdryer. 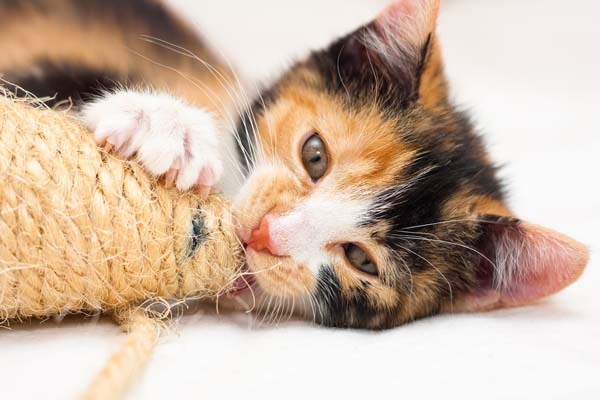 Regularly play with and exercise your cat: If your cat is wary of certain areas of your home, initiate play in that area to help her build confidence. Interactive toys: Distracted cats can be less likely to experience stress. While you’re away, leave puzzle toys and other environmentally enriching activities for your cat to discover. 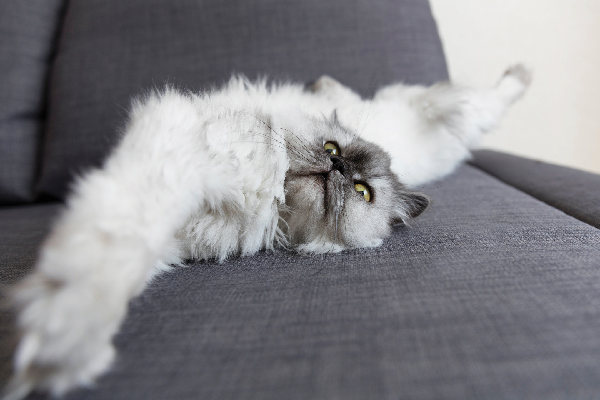 Remain aware of the signs of stress in cats, and always check with your vet to rule out health concerns when you notice stressful behavior. 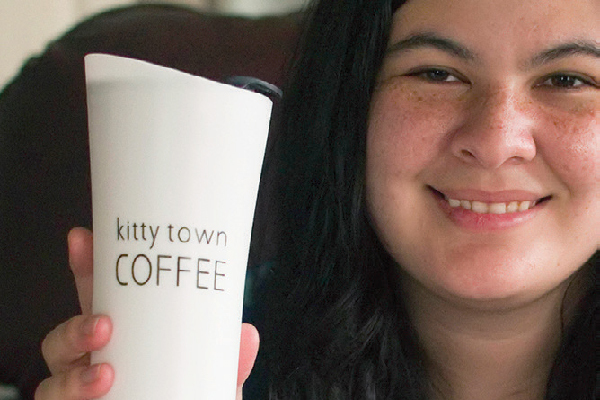 Then, make the changes in your home or routine that will help keep kitty feeling safe, comfortable and confident. Thumbnail: Photography ©MarynaVoronova | iStock / Getty Images Plus. Me and my mum brought our new cat home today but he keeps hiding under my bed and keeps trying to get on top of the closet. What do I do to stop this from happening ? I thank my cat is stressed. My parents are watching a friends dog and he dosen’t lile cats so my cat has been in my room for about 2 months. He started to play rough and bite and scratch. When my parents take the dog out of town for a bit I’ll let the cat out of my room and he just runs around meowing non stop. What can I do to make this easier on my kitty? My Siamese kitten is just about 1 year old. My granddaughters come over occasionally, maybe once or twice a month and sometimes stay over night. They are age 10 and up. My kitten is always anxious. Sometimes she will come up to them, but most of the time she hisses or runs away. What can I do so they won’t forever be scared of each other, the kids and the kitten. I tried melatonin nuggets, but she will not eat them. Would like to find out if my cat is stressed. He’s been vomiting every time after eating solid food (kibble) but when adding soft food to his kibble he eats just fine and no vomiting. He pooped and urinate as normal. The vomiting happens just after he spend 2 days outside in the backyard. He is a housecat. Because he likes to sneak outside we kept him inside. Soon after, the vomiting starts. Any suggestion? Could it be that he is stress cause he couldn’t be outside anymore? Should I bring him to the vet instead?